The field of recommender systems grows rapidly according to the recent development of practical intelligent systems. However, even though the field is exceptionally practical compared to the other computer-science-related topics, many researchers are actively studying recommendation techniques in their lab. 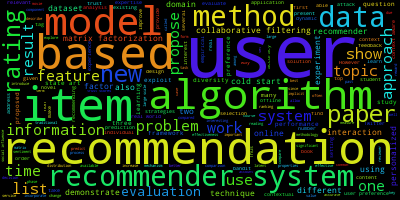 Here is a question: what are the research trends in recommender systems? 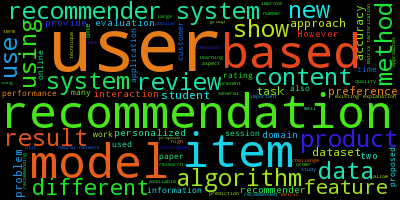 I tried to understand the trends from word cloud by using abstract of papers accepted for ACM RecSys Conference, one of the biggest major conferences on recommendation systems. This Spider module allows users to pass an argument yy to specify which year's RecSys abstract you want to get. 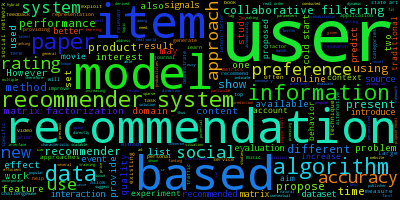 Okay...the result is trivial... Everyone commonly uses the terminology of this field such as "recommendation," "model," "user," and "item" to write their abstract. 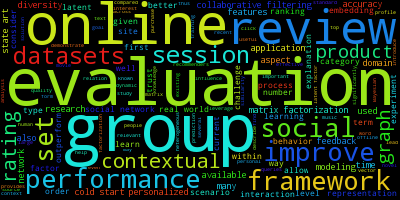 Historically, the study on recommender systems starts from user-item rating matrix as what the GroupLens research group did on the MovieLens data. More specifically, a term "recommender systems" simply refers one well-known technique named Collaborative Filtering (or Matrix Factorization in some sense). 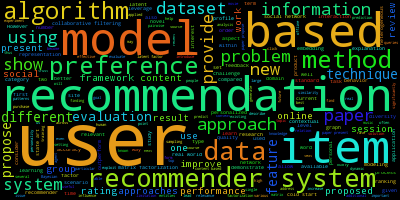 Here, see the word cloud from 2014 and 2015 papers; we can observe that research related to "rating" data played an important role until a couple of years ago. 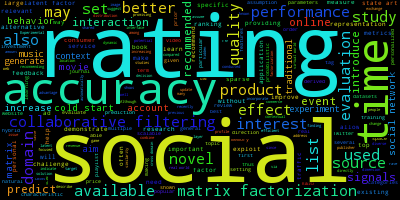 On the other hand, in 2016 and 2017, "rating" gets much smaller than the past two years, and it is really hard (and impossible for me) to look for "matrix factorization" and/or "collaborative filtering." Of course, we cannot conclude by just using the limited amount of data, and some actual trends are very similar to the field of machine learning e.g., deep learning for recommender systems. 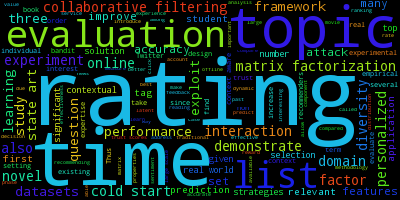 However, at the same time, I strongly believe that recommender research focuses more and more on realistic scenarios in the future as the word cloud illustrates. Data for the highly practical applications always comes from a wide variety of real-world user-item interactions, and it is not limited to ratings on a 2-dimensional matrix.